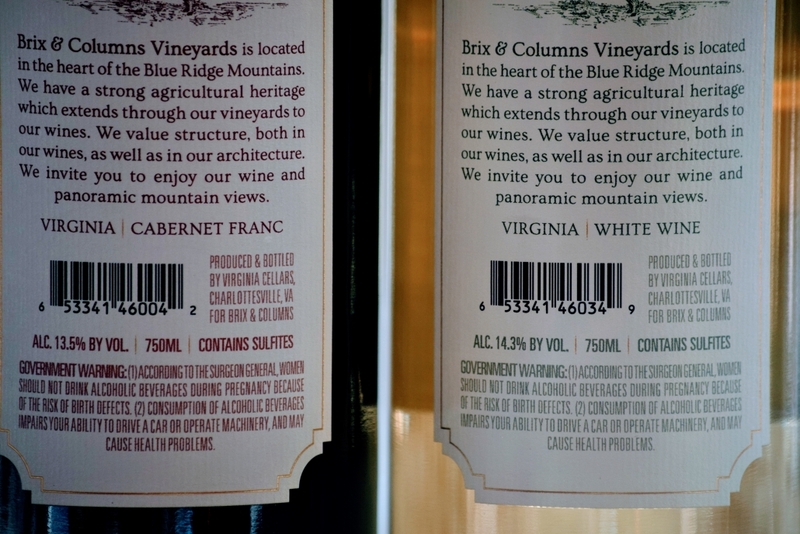 Wine labels from Brix & Columns wine. Last week I heard someone asking Mom why there were sulfites in our wine. 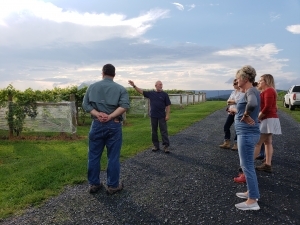 They were lamenting that the European wine they had recently enjoyed on vacation said nothing about sulfites on that label, but all American wines list “contains sulfites” on their labels. 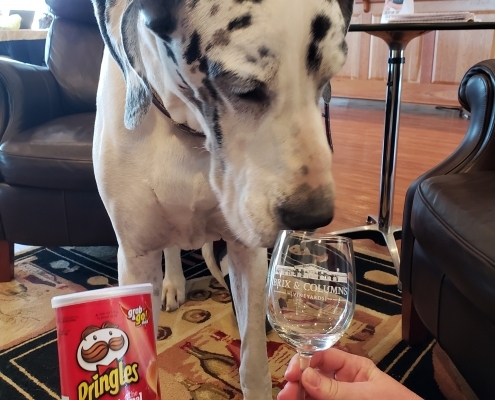 Now, I know I’m just a dog, and there may be one or two things about the wine world that I don’t know yet, so I figured this opportunity was ripe for me learning more. It turns out that sulfites appear in wine one of two ways. They are a natural byproduct of the yeast fermentation process, and winemakers often add them to the wine to stop further fermentation and to prevent the wine from spoiling while it is in the bottle waiting for you to drink it. 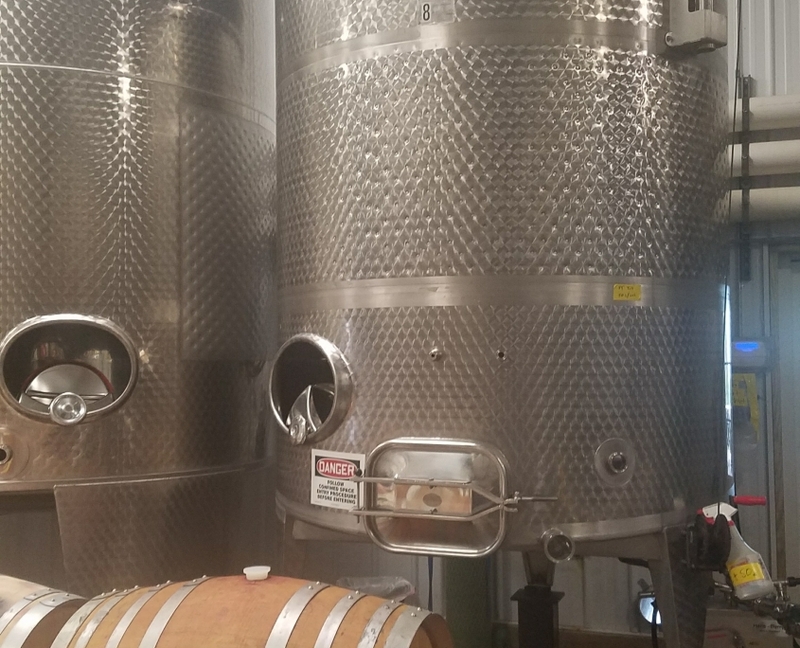 The reason they help with both of these issues is because sulfites (otherwise known as sulfur dioxide or SO2) are both antimicrobial and antioxidant, so they help keep the wine from receiving too much exposure to spoilants or oxygen. They are used in higher quantities in wines that are sweet, that are low in acidity, or that are white. If you are looking for a wine that is lowest in sulfites, your best bet is to grab a bottle of dry red wine since white wines typically have twice as many sulfites than reds. Sulfites don’t just help preserve wine, though, they are also present in foods like dried fruits, soda, candy, french fries, potato chips, and so many others. 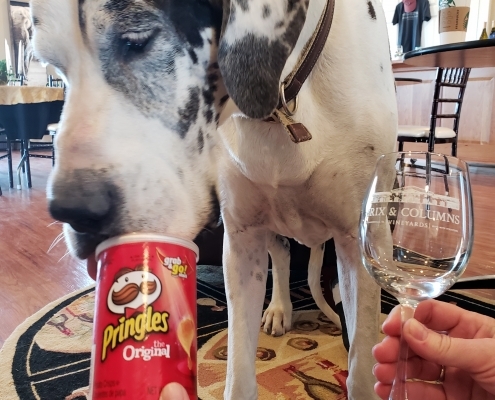 If sulfites equal french fries or potato chips, you can count me in – just don’t tell Mom you invited me to join the junk food party! It turns out that the only difference in sulfites in wines between here in the US and in Europe is in the labeling. 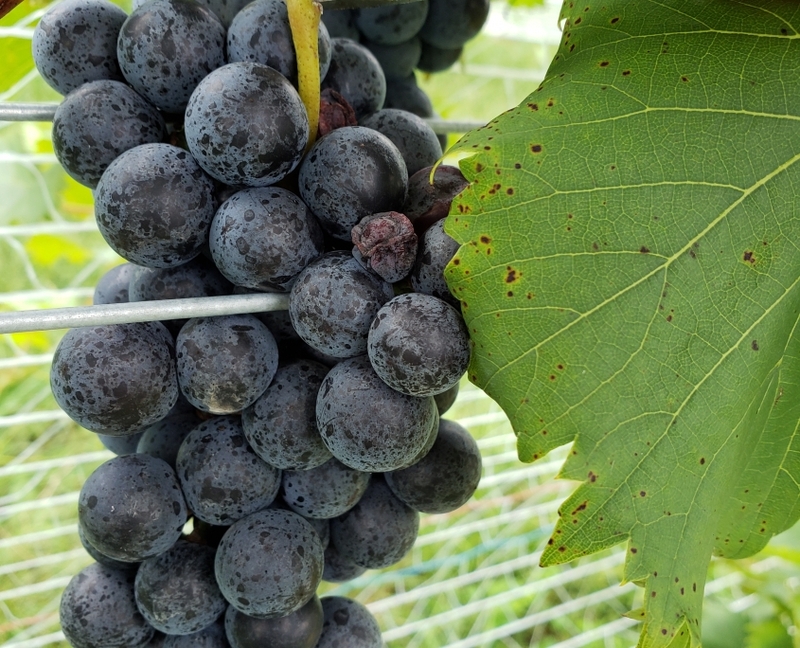 In the United States, wines that contain more than 10 ppm (parts per million) require the label “contains sulfites”, whereas European standards don’t have the same requirement. 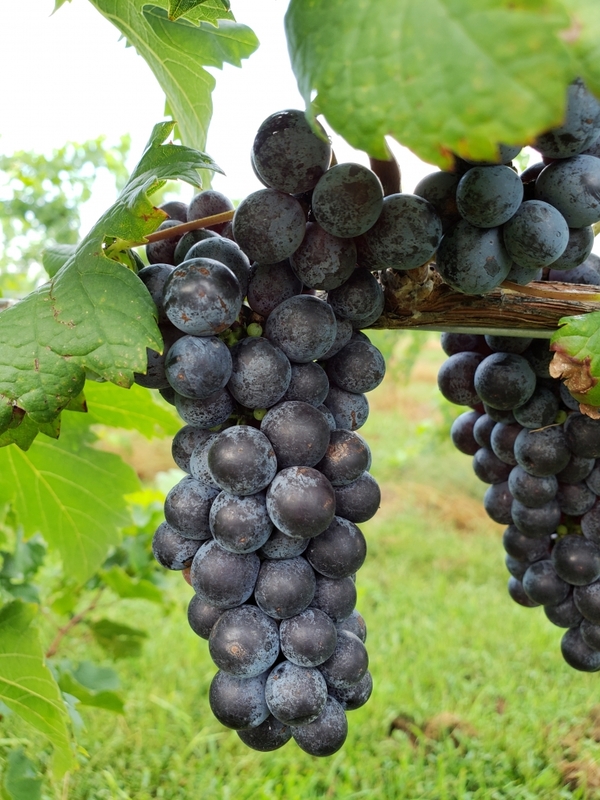 The upper limit allowed in the United States (350 ppm) and Europe (210 ppm) do differ, but you can expect most dry red wines to have about 50 ppm no matter where you are in the world! Sulfites have been used in the wine world since the Romans first discovered their preservation benefits, and now that “added sulfite”-free wines are making their way to the wine markets, it is easy to see why winemakers over the past few centuries have decided to continue adding them – they allow wine to keep and age well. Now that I think about it, I must have plenty of sulfites floating around inside me, because I think everyone can agree that I am aging like a fine wine! 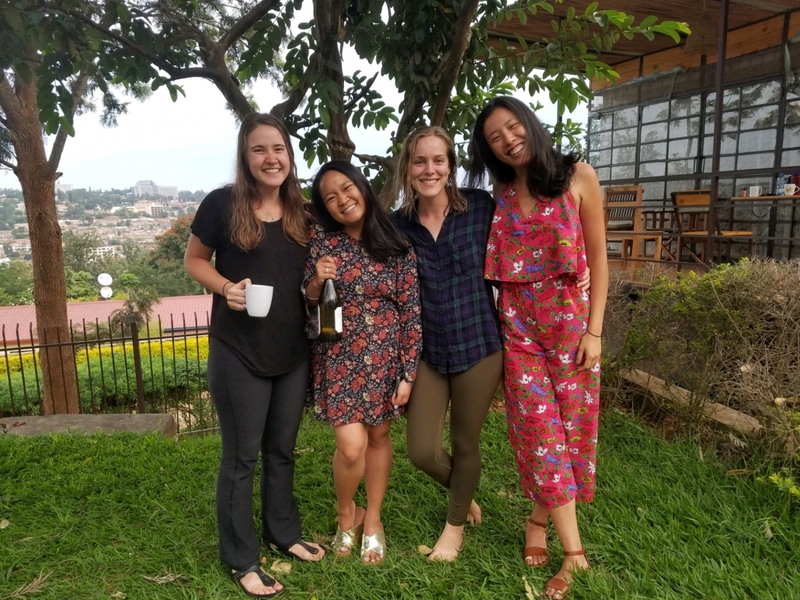 Emma with friends Gabby, Grace, and Kerong. Last month my mom left me for over 2 weeks! Can you imagine that? 14 long days without her to follow around and wait for her to give me the best ear rubs anyone can give? I was morose. I did nothing but mope while my dad tried to love me back to my normal self. Thinking back about it now, I suppose she did leave me for a very important reason. You see, my sister Emma is serving in the Peace Corps in Rwanda, and my mom misses her terribly. I try to keep her lots of company, but I know it doesn’t completely take the place of Emma. Mom had a really great time and got to see lots of fun things besides just Emma. 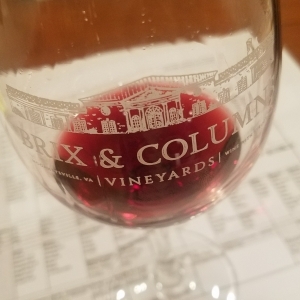 She even took some of our Brix & Columns wine with her to enjoy with Emma and her friends. The wine sharing evening had all the trappings of perfection – until they realized there was no bottle opener in sight. Grace came to the rescue with the old pen and rock trick and saved the day! She simply stood a ballpoint pen up on the cork, and then used a rock to bang down on the pen and push the cork in the bottle. It was genius! Grace working her millenial magic on our Chardonnay. Let’s all give Grace a round of applause. She is a long ways from her home in California, so we will have to clap extra loud for her to hear! 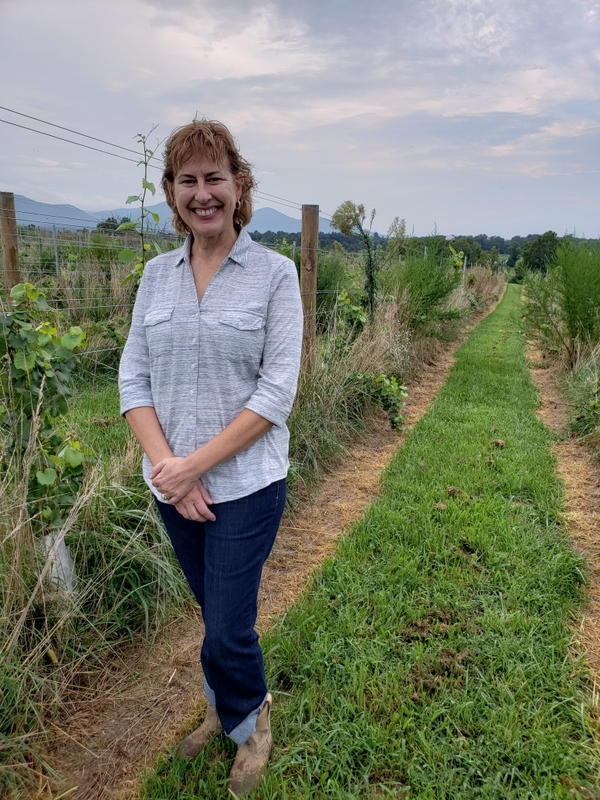 It took a millennial from a West Coast wine state to teach this East Coast winery mom from Virginia a few tricks. 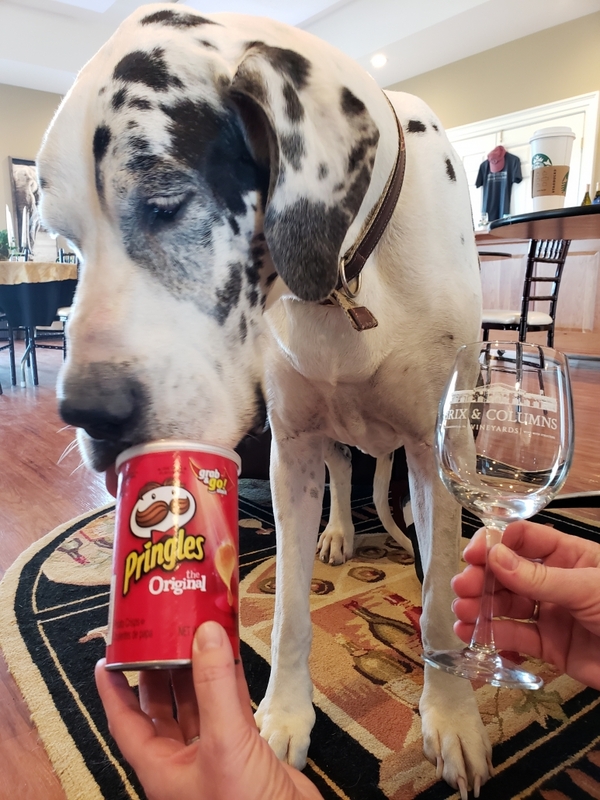 I figured there had to be more ideas out there to uncork a bottle of wine that were nearly as brilliant, so I looked around and got my paws on some to share with you! Please keep in mind that these are just some fun discoveries, we aren’t recommending that you try any method other than the tried and true corkscrew. One of the easiest methods is to screw a LONG screw into the cork, then use the claw side of the hammer to pull it out. Another pretty simple, and mind-blowing approach, is to use a bike pump. This method, of course, needs you to have access to something that might not be available to everyone, but if you are a cyclist reading this, I am giving you pure gold here. You insert the needle all the way into the cork (until the hole of the needle is below the cork) and pump air into the bottle. Eventually, the cork will work its way out. If you only have your keys on hand, you are in luck as I found a method for you. 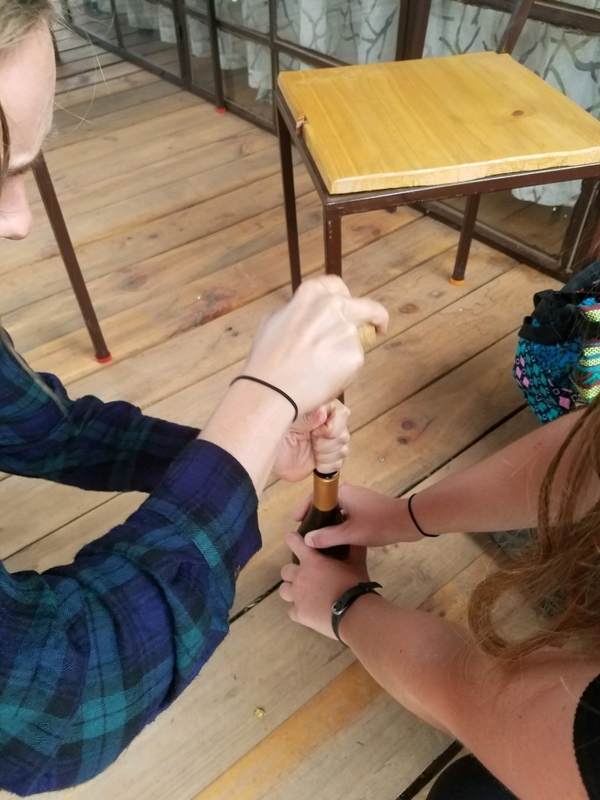 Push your key into the cork at a 45 degree angle, and twist it in a circle until it pulls the cork out enough for you to remove it the rest of the way by hand. If you happen to have a machete on hand, you can always try the “chop the neck of the bottle” off method, but that one sounds a little scary to me. You might lose a toe, not to mention the bottle could shatter and you would lose all of the wine you were trying to drink! Two of the approaches I found require heat to work. The first one uses a blowtorch because who DOESN’T have one of those sitting around? On a room temperature bottle of wine, you can aim the torch directly below the cork line of the bottle, and the heat will push the cork out of the bottle. The other heat-based method employs a big pot of boiling water. After the water has come to boiling, remove from heat and place the wine bottle inside. Eventually, the heat will push the cork out, and your wine will be ready to drink. This would be perfect if you were already planning to heat your wine for mulled wine. The final method is the one to go for when you have none of these other supplies on your hand. You basically just bang the cork right out of the bottle by hitting the bottom of the bottle with your shoe or by wrapping the bottle in thick padding and hitting the base against a tree. Theory says that it works eventually; just make sure you keep a close eye on it and stop before the cork comes all the way out. You wouldn’t want to spill any of that hard-earned wine on the ground! 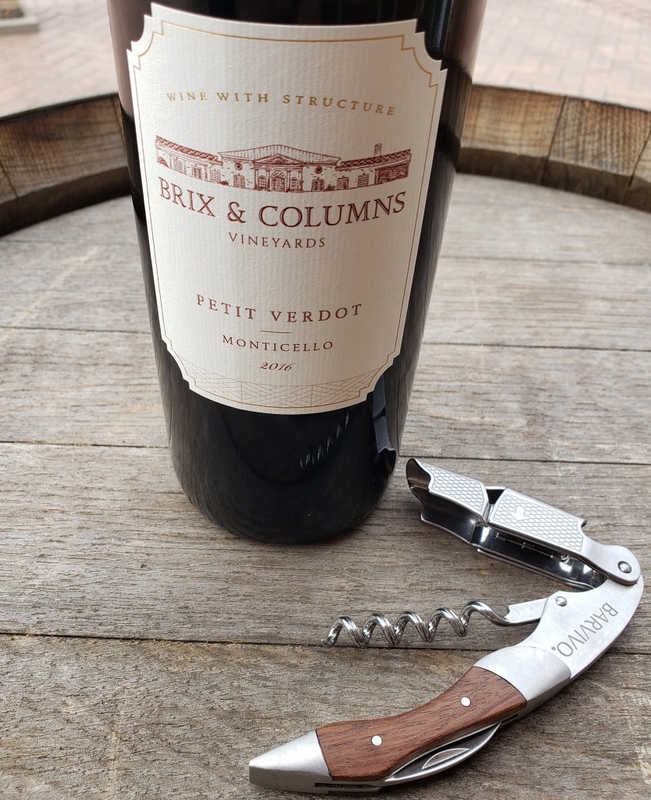 Our Petit Verdot pictured with our favorite style of wine opener. These all sound really fun and interesting, but some of them also sound pretty dangerous. I personally wouldn’t recommend trying any of these at home, and the best solution to always having a way to open your bottle is to carry a handy double-hinged corkscrew around with you. You can check out our favorite kind next time you come to the winery, but only after you have a time to love on me! 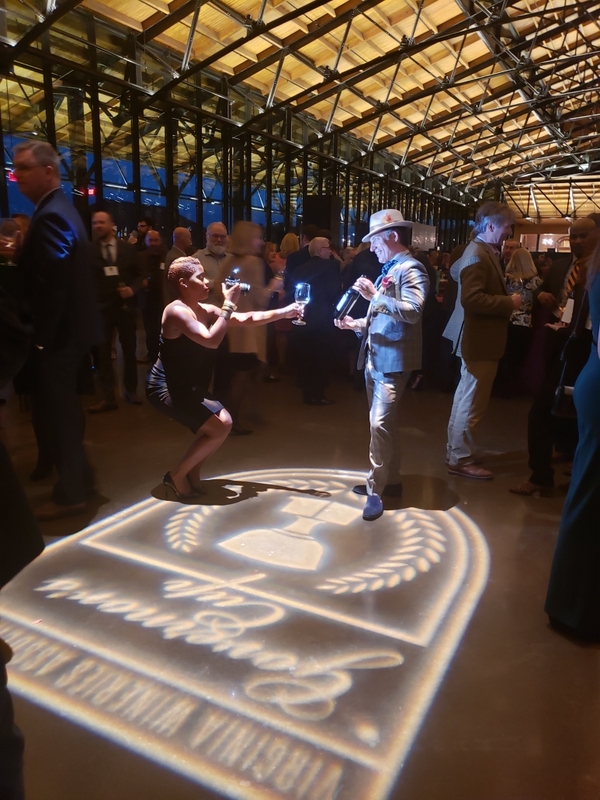 In the Virginia wine world, February means something very exciting. No, it is not my birthday month. That is August, just in case you are wondering, and I wear a size yummy in treats. 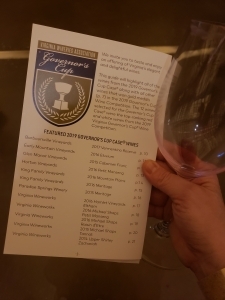 What February is known for is that it is the month when the Virginia Governor’s Cup announces all of the award winning wines AND it is the month when the Governor’s Cup Gala is held. 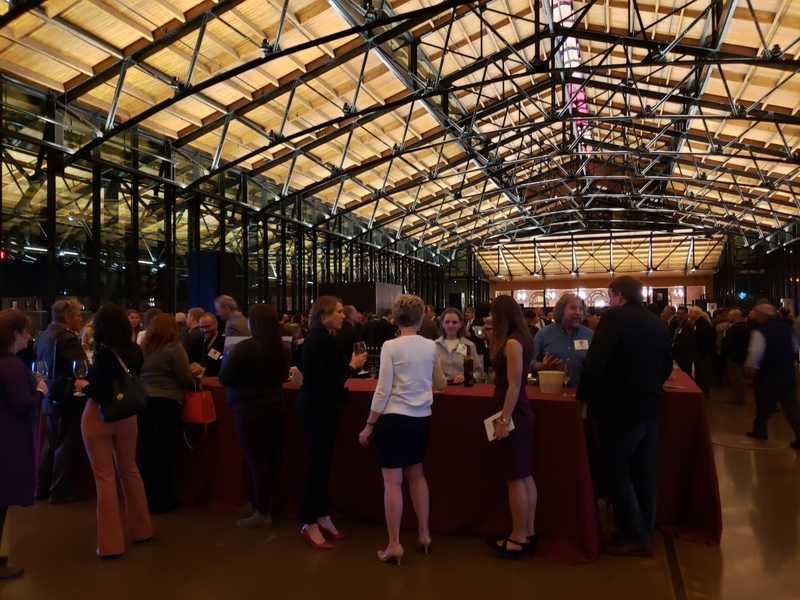 This fantastic event gives wine lovers around the state the perfect opportunity to taste all of the gold medal winning wines. 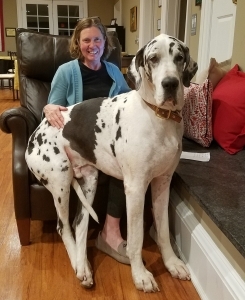 When I say wine lovers, I should make it clear that invitations to the gala were not extended to me, Winston the Wine Dog! Hummmppph. 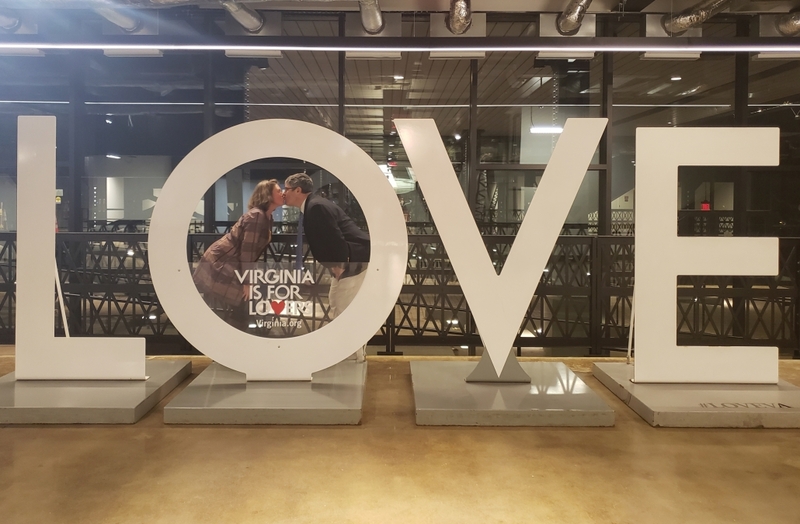 I suppose someone had to work the tasting room, and it was up to Sherry and me to do just that while everyone else headed to Richmond to celebrate the night away. Mom and Dad were too exhausted to talk to me much about it when they got home, but Erin made sure to give me a ring and fill me in on all of the details before they got back. 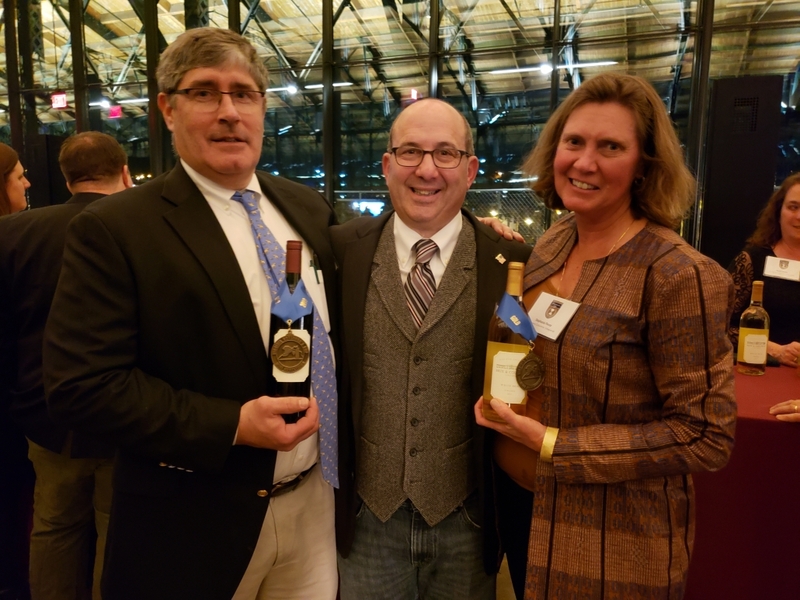 Viognier, my mom’s favorite, surprisingly made very few appearances in the gold medal category, but the judges said that it was a great year for Chardonnay, Petit Manseng, Cabernet Franc, Petit Verdot, and Tannat. Sparklings also made a good show in this year’s competition. 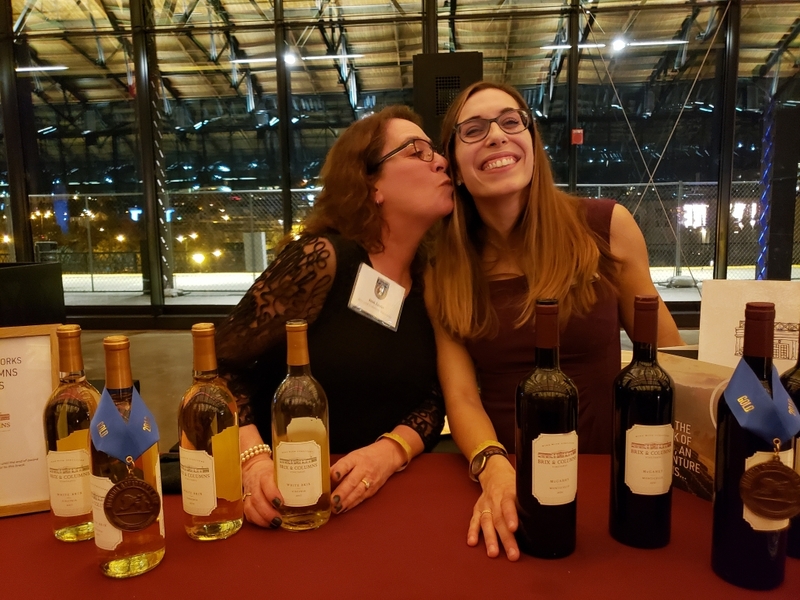 510 wines were entered from 102 different vineyards from around the state, over 100 bottles of Meritage were entered, and more than 50 bottles of Petit Verdot (Taylor’s favorite) were entered as well. Of these 510 wines, 13% won gold medals (60+). As always, 12 wines were selected for the Governor’s Case. If you want to learn more about the judging process, click here for my prior blog about it. 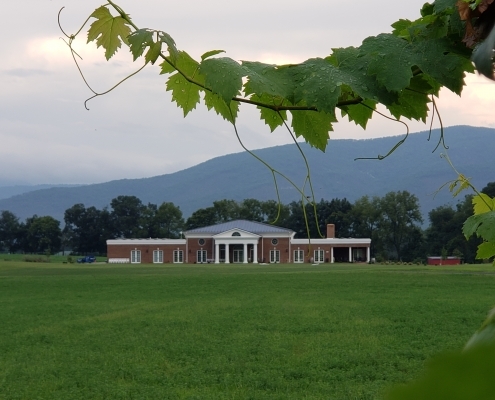 Barboursville Vineyards had an excellent 2017 Vermentino Reserve that was dry and citrusy with a lingering minerality. Early Mountain Vineyards’ 2016 Eluvium was a Merlot and Petit Verdot blend that was aged in new French oak for 18 months and full of dark fruits. Glen Manor Vineyards had a 2015 Cabernet Franc that was fierce and delicious. They don’t filter any of their red wines. King Family Vineyards made an impressive show this year with their 2016 Meritage and their 2016 Mountain Plains. Both blends were aged for 18+ months in French barrels (one in new, and one in 45% French). Paradise Springs Winery made a strong showing with their 2015 Meritage. It was full-bodied and brimming with possibility. Our very own Michael Shaps absolutely stole the show with five of his wines placing in the Governor’s Case. His 2016 Eltham for Hamlet Vineyards is a Merlot and Petit Verdot blend that was aged in 50% new French oak and bold and flavorful. Michael’s 2014 Zachariah for Upper Shirley was a blend aged for 18 months with a well-rounded palate. Three of Michael Shaps own brand made the case, as well. 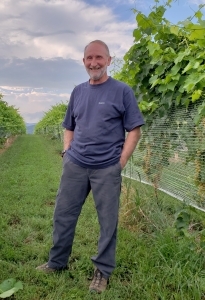 His 2016 Petit Manseng was dry and delicious with pleasant acidity and tropicality. Michael’s 2015 Tannat had great structure and fruity notes. It is definitely one to pick up for the cellar. To finish it off, the 2016 Michael Shaps Raisin d’Etre is the perfect dessert for your evening. Full of peach flavors, this late harvest Petit Manseng expands your view on how versatile this grape can be! 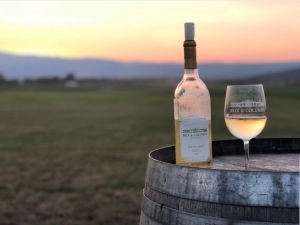 Horton Vineyards‘ 2016 Petit Manseng won the coveted Governor’s Cup this year. At 0% residual sugar, it is deliciously dry and has a wonderful lingering acidity. 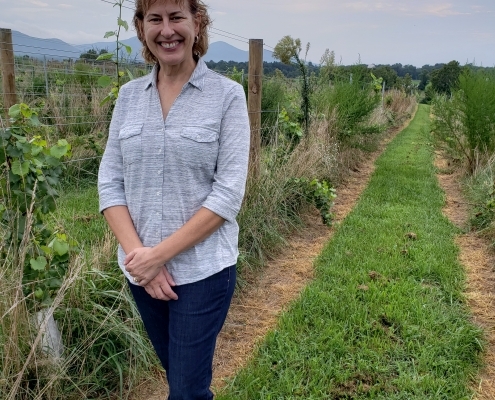 We especially appreciated this awarding because Horton Vineyards has done so much to advance the Virginia wine world. Just over a year ago, Dennis Horton passed away and left a legacy in his wake. What a fitting honor for his vineyard to be awarded this year. Erin also made sure to tell me about the food spread – she knows the way to my heart. 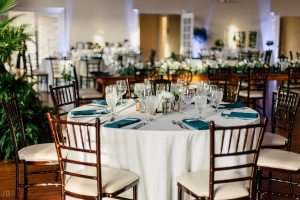 The event was hosted by Mosaic again this year, and it had another delectable spread of nouveau Southern cuisine. Platters full of pimiento cheese, smoked shallot and gorgonzola spreads, roasted veggies, hearty Italian deli meats, and sweet potato biscuits stuffed with country ham were scattered throughout the tasting hall. There were also stations with delightful treats such as she-crab soup and prime rib with roasted and mashed red potatoes. Yumm! 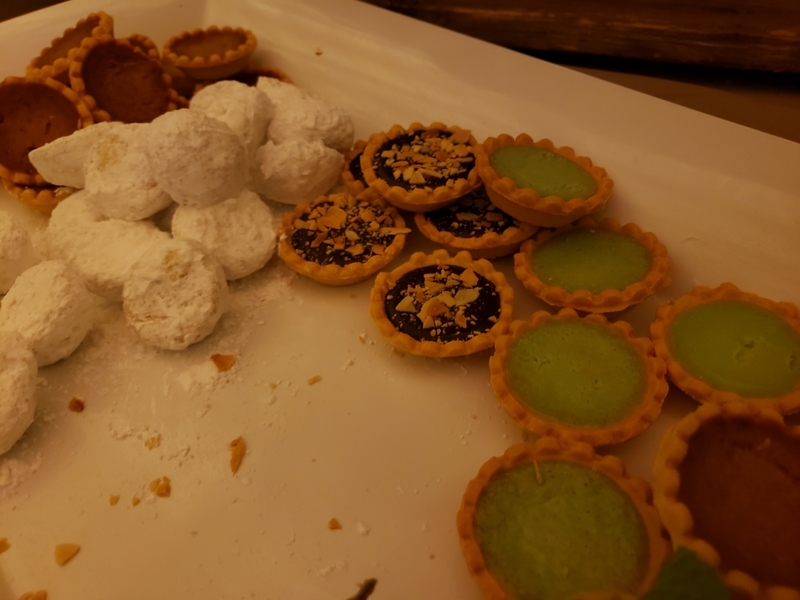 Dessert was an array of tarts filled with nutella, sweet potato, key lime, and pecan. I think this spread alone is why Mom and Dad never invite me along. They think I don’t know how to control myself, but the only thing I don’t know to control is my love for them! It’s hard to believe that our vineyard finally has something on the menu that is as sweet as I am. 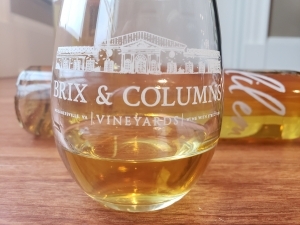 When we released our dessert style Petit Manseng, Lil Em, last week, I have to admit that I didn’t know a lot about dessert style wines. Over the past week, I have undergone an investigation, and I have sniffed out enough information to share a basic understanding with you. Much like me, dessert style wines are highly sought after and popular with most palates. 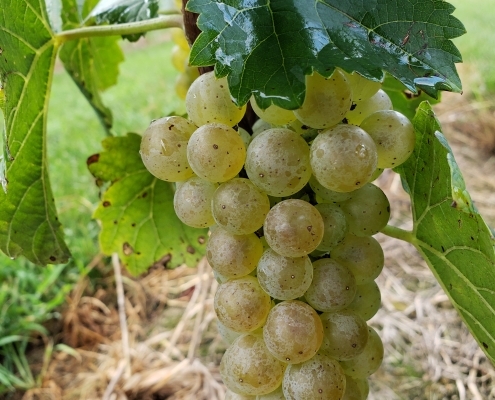 Petit Manseng is an ideal grape for making dessert wine: it has a longer than average ripening season, it is high in acid, it is thick-skinned, and it grows in loose bunches on the vine. All of these elements combine to make a grape that is perfect for late-harvesting. When grapes are harvested past the ideal picking season, they begin to shrivel on the vine. A process called passerillage by French grape growers, this drying on the vine helps to concentrate all of the flavors, aromas, and sugars. Because the grapes are so loosely bunched, Petit Manseng is able to escape fungus infestation better than other varieties. 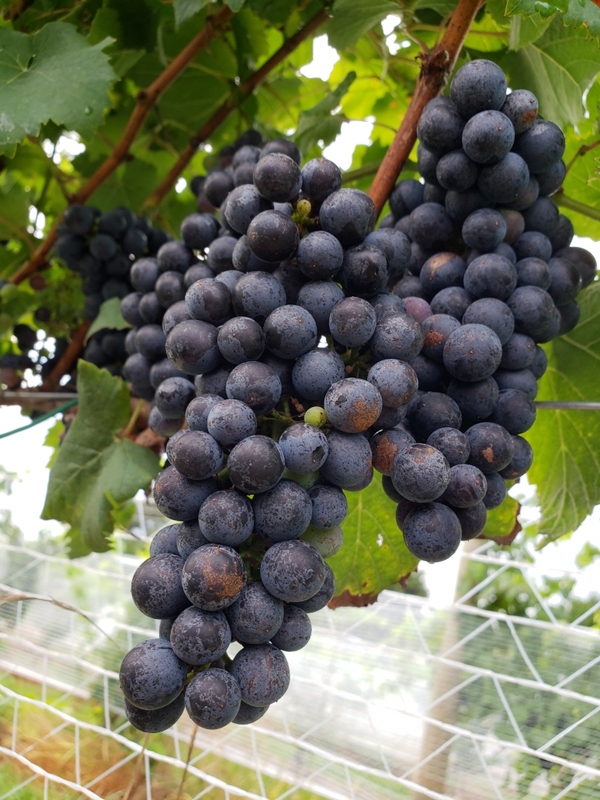 When the climate doesn’t allow a late harvest, vineyards can also choose to pick grapes at their prime harvest time and dry them before pressing them for juice. 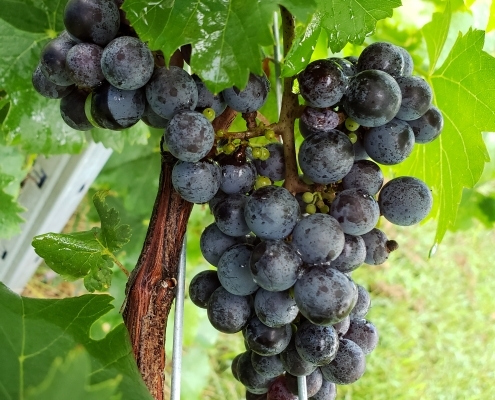 You can learn more about this grape by clicking here. Another option for producing dessert style wines is to do an ice harvest. 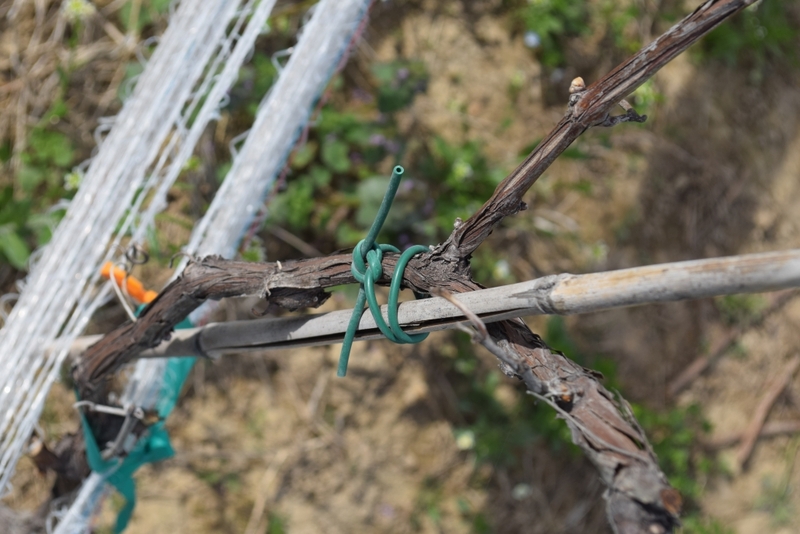 In this method, grapes hang on the vine past harvest time waiting for the first frost of the season. When the frost hits, the grapes are picked before dawn and pressed before they can thaw. 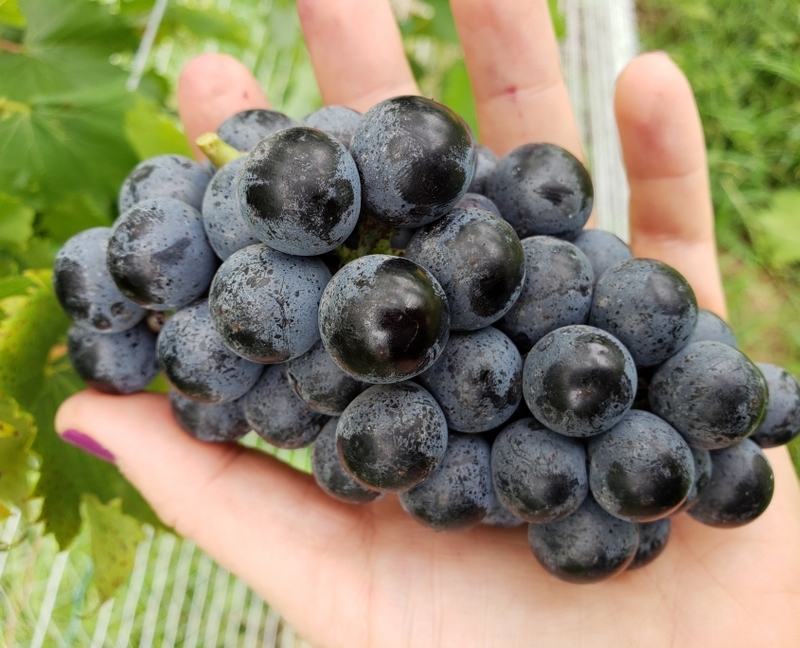 The lower moisture content of these grapes helps to concentrate the flavors even more than typical late harvest grapes, and ice wines are often some of the sweetest dessert wines on the market. 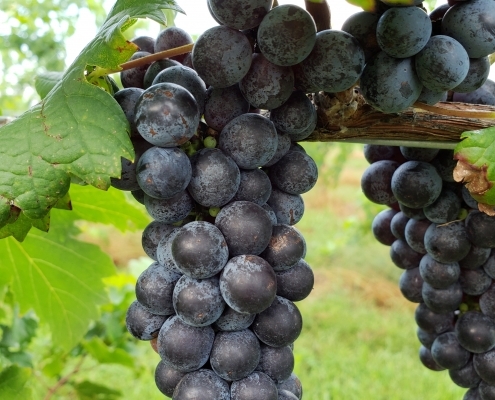 The final and most prestigious method of making dessert style wines is by hoping/allowing your grapes to get Noble Rot. 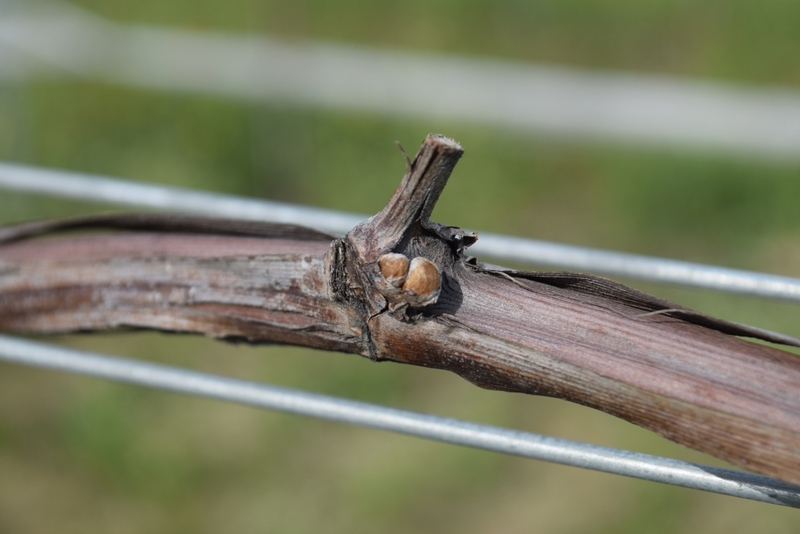 In this method, the Botrytis Cinere bacteria infects the grapes and thins the skins until they are porous. The water evaporates through the holes in the skin, and the remaining fruit has more concentrated aromas, acids, and sugars. Characterized by tastes of ginger and honey, wines that are made via this method are typically higher in cost since the risk factor is large, and the vines produce less juice this way than normal. 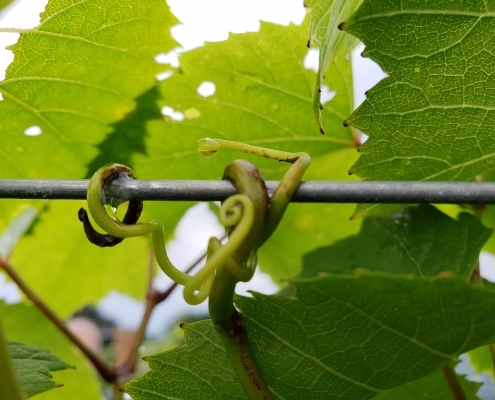 On average a vine might produce one glass of wine via this method versus 2-3 bottles of dry wine using typical methods. Dessert wines are sweeter not just because of the harvesting methods, but also because the fermentation of sugar into alcohol is stopped before the majority of sugar is changed over. This process can be halted in one of two ways: the wine can be fortified with brandy or it can undergo a super-cooling. Both of these methods produce an environment in which yeast can’t survive. The actual term dessert wine can be used to refer to any wine that has an alcohol percentage of 14% or higher and it is typically used to describe fortified wines such as our Six Penny Postscript Port Style. Because our Lil Em is 11.5% alcohol, we call it a dessert style instead. All dessert and dessert-style wines pair best with foods that are as sweet or even sweeter than the wines themselves. They also pair well with foods that are salty enough to combat the sweetness of the wine. 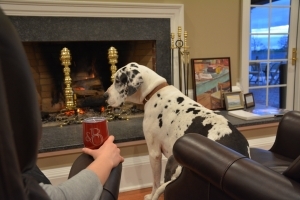 Me, on the other hand, I pair well with anything, but especially with those two chairs by the fireplace! I was sitting down in front of the fire with my mom and her laptop the other night, and as we were scrolling through Facebook, I noticed some of the gratitude posts that other folks were posting. 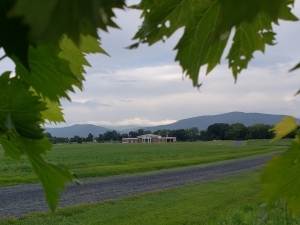 That got me thinking that I have so much to be thankful for: I have two amazing parents, acres upon acres to run on, winery guests galore to greet everyday, and an abundant wealth of wine knowledge to share with all of you! As it goes, one thought leads to another, and it occurred to me that it has been ages since I wrote one of these buggers for you. October was a whirlwind and posting on the blog never managed to get crossed off the list. For that, I apologize, but I would also like to share with you my own personal gratitude post. Mom and Dad – I already talked about how great my parents are, but I think they deserve another mention. Without them, I never would have had the chance to meet any of you! 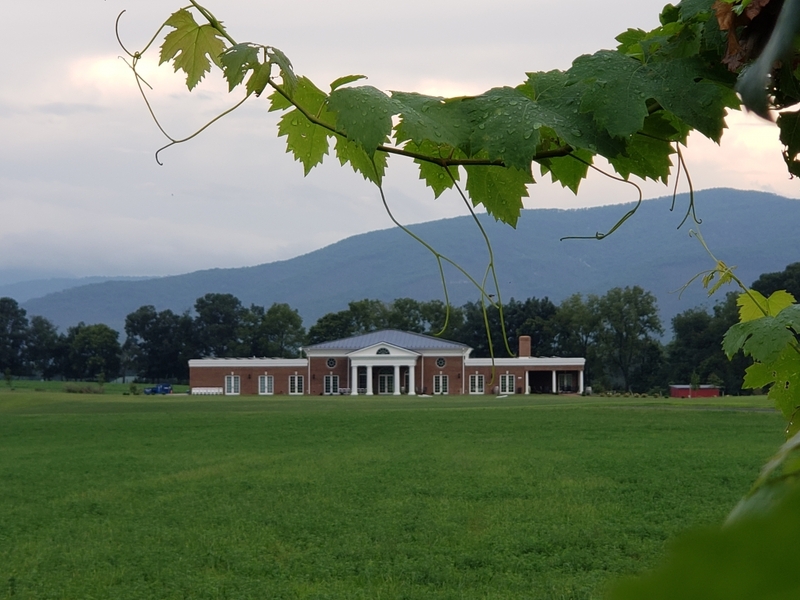 When they started the wedding venue, that precursored the birth of this vineyard, they set a ball in motion that led to the creation of this fun venue space located in what some might say is the middle of nowhere. In doing this, they have created a space that has led to countless unions, evenings spent with family, nights filled with food and fun, live music performances, Capernaum proms, retirement parties, Christmas celebrations, paint nights, terrarium creations, and so much more, but most importantly, the dream of what this building could be has led to the formation of so many very special friendships, and that is what I am most grateful for. Ryland – Even though he is my nephew, Ryland is the best friend I could ask for. We run and run and sniff out whole heaps of trouble. I wish he lived here all the time, but I know Taylor and Laura would miss his presence in their Richmond home. Dogs just add incredible value to your life! Mac & Olive – These are my kittens. I say kittens, but they have actually been here for 11 years now, and they keep me wonderful company. 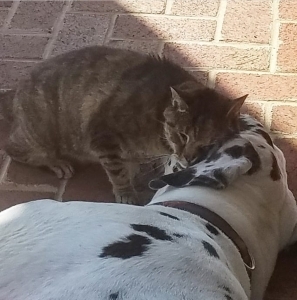 Sometimes I go outside in the mornings to lay in the sun, and they give me ear rubs to my heart’s content. I don’t even have to fight them for my food – mostly because I gobble it down as soon as Mom dumps it into my bowl. 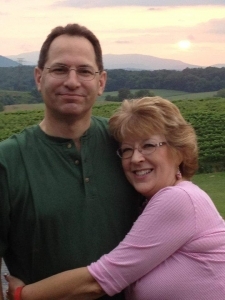 Karen & Scott Weeks – What were once our neighbors have quickly grown into our friends. 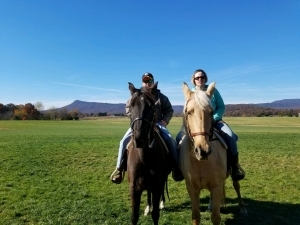 These guys take time every weekend to ride their horses down to see me, and I love seeing their quivering noses and sniffing their barn smells (the horses that is, not Karen and Scott). Steve & Gina – If you know me, you know I love warm fires, and these folks are the ones I have to thank for keeping the B&C fireplace stoked during those busy evenings when Mom and Dad can’t tend it. 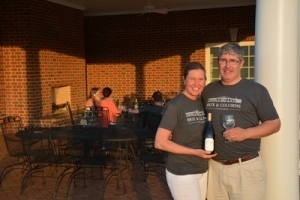 These two have been some of our biggest fans since day one, and we always look forward to seeing them walk through the door on Friday evenings with dinner and reading material in hand. 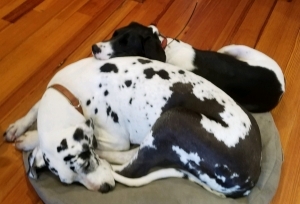 Amy & David – Can a dog ever have too many toys? If you ask me, the answer is always no. Luckily for me, these two believe the exact same way. One of my favorite new toys they have gotten me is the green dragon. I could count how many times I’ve chased it around the rooms down here, but I would run out of toes! Whether they venture out on a Sunday afternoon or a random weekday, we are honored to have become a staple of their week! 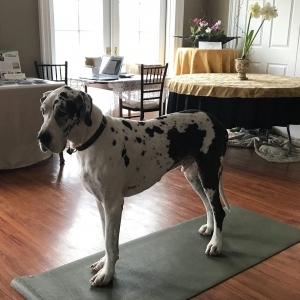 Rachel – I can be a little stressed sometimes (mostly just from the idea of so much food coming through that I am not allowed to eat), and Rachel makes sure to visit twice a week to keep me relaxed and meditated. 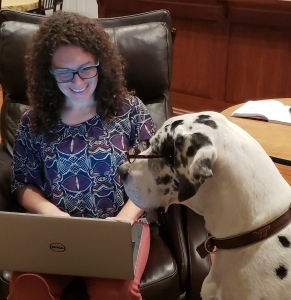 Sometimes she even allows me to teach the class – I am a pro at down dog! If you haven’t had a chance yet, please come join one of her classes on Wednesday @ 5:15p or Saturday @ 10:00a. 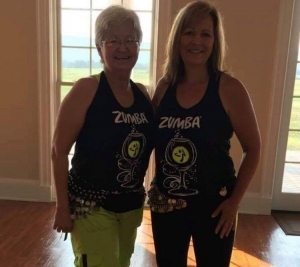 Wendee & Morina – Even though Zumba hasn’t taken place in a while, whenever we did have it, I always had fun joining in. This old dog can still shake a leg! Keep an eye out for Zumba making a reappearance in the spring. Mikey – Mikey, Mikey, Mikey. I would say I am grateful for his yummy food, but that wouldn’t be exactly true. What is true is I am grateful for the yummy smells his food brings, and I hear that other people (who are actually lucky enough to eat it) are grateful for his cooking at our wine pairing dinners. Did I hear Mom say that we have something family-style planned for December? I will be stealthily scouring for dropped morsels! 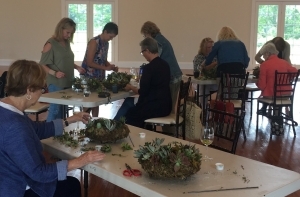 Tamara – Tamara does the most amazing botanical creations I have ever seen; now granted, I don’t get off the farm much, but I think her arrangements are creative, unique, and innovative. What I love most is that she never puts them anywhere that I can knock them over with my tail. 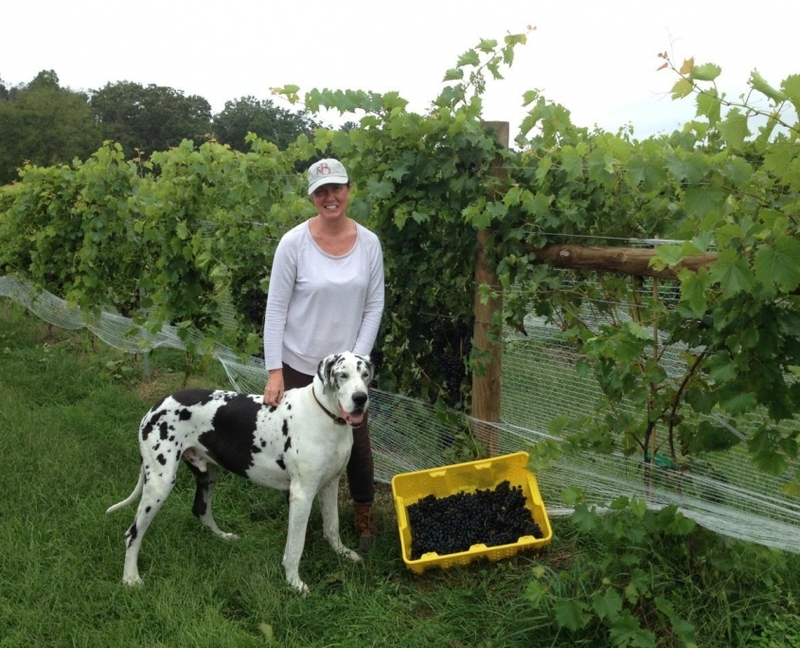 Lucky for all of you readers, Tamara offers classes at our vineyard every few months. The next one coming up is the Christmas Wreath Workshops. You can find more details on our events page. 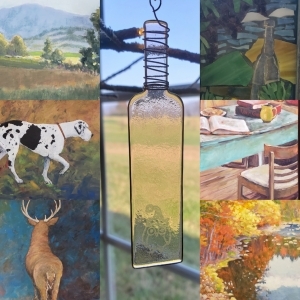 Sharon, Dietrich, and Brydgeworks – These are the incredibly talented guys and gals who have supplied our tasting room with the locally inspired artwork that decorates our walls. There is one particular painting that I think is the most handsome of all, but I am not going to tell which one that is on here; maybe you can come in this week to make a guess? 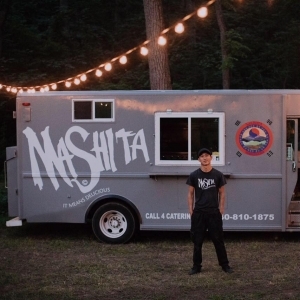 Sunsets over the peaks and Friday night regulars and the musicians who come to serenade me – Is there anything more beautiful than watching the sunset over the Massanutten Mountain when you are surrounded by people you love? I haven’t discovered anything that beats it yet, and I think I must be the luckiest dog in the world to be able to share the beauty with all of the ladies and gentlemen who come out to see me most Fridays! 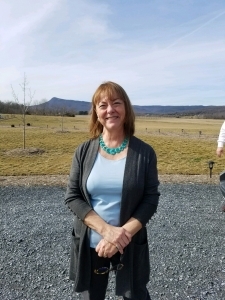 Joyce – Each week we get a visit from a woman for whom everyone is grateful. Without her, I wouldn’t have sparkling floors to walk on and doors to smudge up by pushing them open with my nose. Every week, whether we have had a weekend filled with events or not, Joyce comes in and cleans the building. She sweeps, mops, and scrubs to make it all brand new for the next round of festivities! 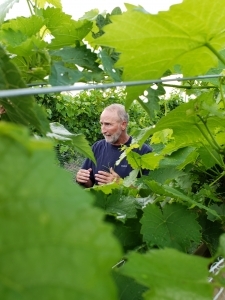 Gene – This is one man that I absolutely love running through the vines to find. Gene is out at the crack of dawn working in the fields to do all of the things that vine management entails: pruning, trimming, weeding, inspecting, measuring, cultivating, tying, leaf pulling, mowing, harvesting, and so, so, so much more. 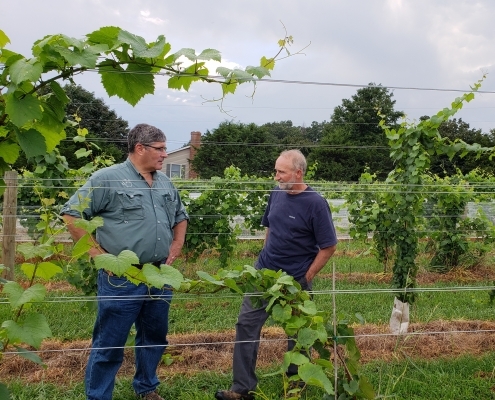 He keeps our vines looking incredible and he learns more each day and is so generous in teaching us all of what he knows. I don’t know what we would do without him! Jacob – Now this guy has been working here for years! Living right down the road made us a very convenient spot to start his first job, and lucky for us, he loves the world of farming. 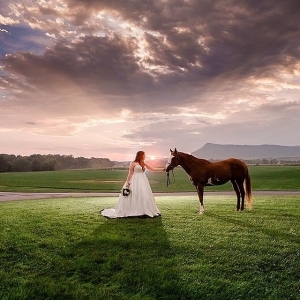 Jacob takes care of most of the mowing around the property and is a godsend when it comes to setting up for weddings. 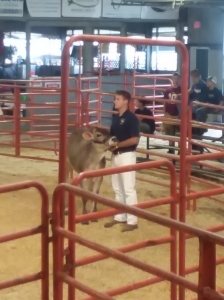 He recently raised a steer in our barn, and we were honored to purchase it from him at the Rockingham County Fair. We are incredibly grateful for his willingness to work hard, but even more so, we are honored to be witness to him growing up into such an outstanding young man. Shout out to cream cheese – If it wasn’t for this creamy deliciousness, there is no way Mom could get me to take the medicine I need to stay healthy enough to visit with you all! Side note: this medicine is also why it is so important that you don’t feed me everyday people food. It makes me sick, and then I can’t keep down the proper dosage. I hate the days that I am not feeling well enough to come down to greet everyone! Kerus – Is there anything in life that warms a heart more than giving back to others? I am grateful that Mom and Emma got a chance to work with Kerus Foundation a few years ago because that mission trip led to the partnership we have today. 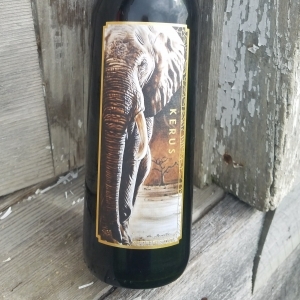 For those who don’t know, every bottle of Kerus wine purchased gives $5 to this foundation. Kerus is a Greek word that means to do something with all of your heart, and that is exactly what Jennie and Marcia have accomplished with their foundation. They do global AIDS education – focused mainly in South Africa – and our sales have raised $5,000+ for them since we started selling it in April. Their work has been so successful that the South African government is now partnering with them, and we are honored and grateful to help them on their mission. I know at least some of you saw the harvesting fun that we had over the past few weeks. For us folks in the wine industry, the harvest is the culmination of a year’s worth of hard work pruning and training vines, examining and treating any pests, wrapping rows in netting to protect the grapes from becoming meals, and carefully watching the sweetening process to make sure grapes are harvested at exactly the right time. 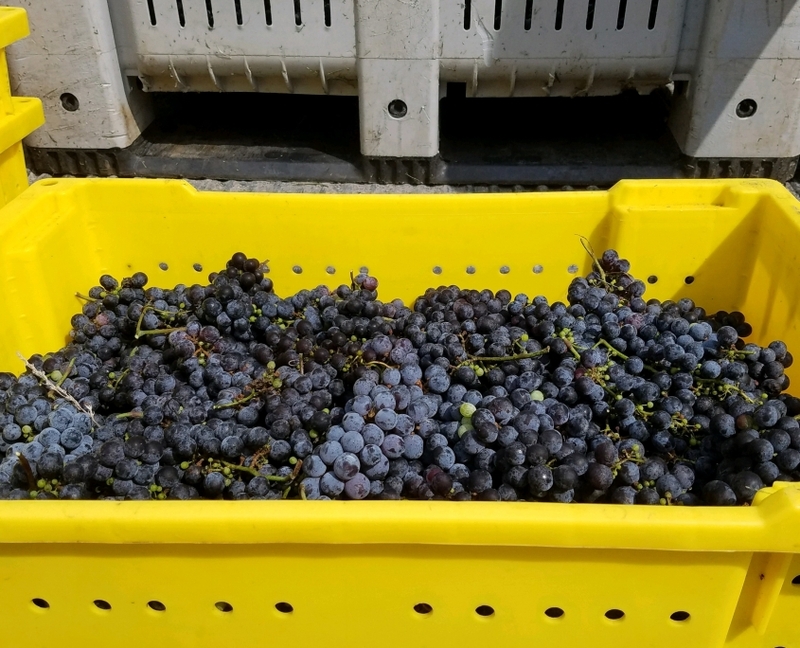 This year, Mother Nature had a different harvesting date in mind, and when there was a prediction of 20 inches of rain coming, we decided to rush the harvest on our grapes even though the brix levels weren’t quite as high as we wanted. If you’re like me, you are more than a little curious about what happens to the grapes when they leave the farm here at Six Penny. That actually depends on which grape you are following! The first thing that happens to all of the grapes is that they get sorted. The best way to get the bad grapes out of the cluster is by shaking them lightly. This movement dislodges any grapes that might be damaged. Grapes are then placed on a table and examined to pick out any other damaged or underripe fruit. At this stage, some of our chambourcin grapes will be put in loose layers and placed in a special drying barn; this process allows them to concentrate their sugars to create the deliciously sweet Port style wine that is a holiday favorite. 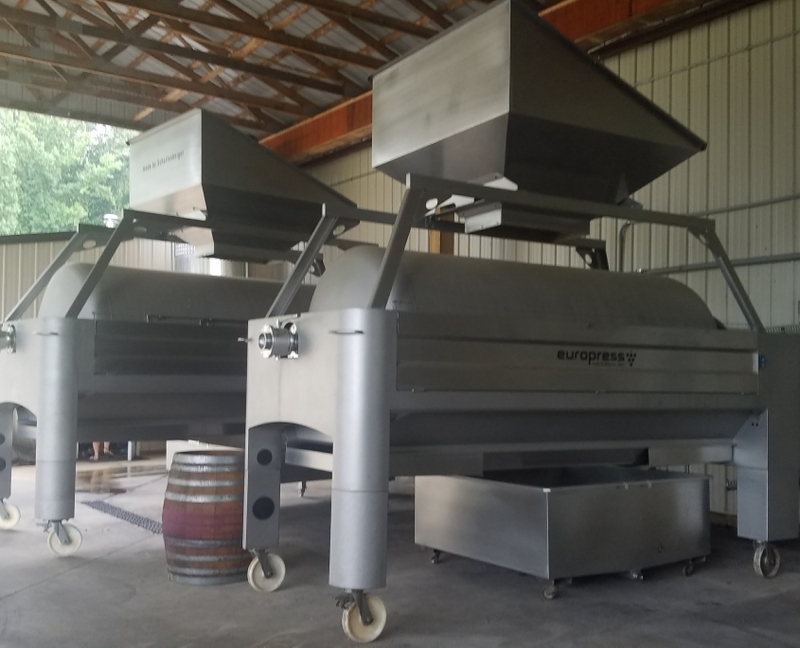 After sorting, the grapes are put into a machine that crushes, destems, and presses the juice out of the grapes. The grapes may be separated from their skins depending on if they are destined for white or red wine. For some red wines, the stems and seeds will be included in the next step of the process to increase the tannins and structure of the wine. Fermentation takes place in large stainless steel tanks that open at the top and have valves in the bottom. This allows for the juice to be piped over itself at regular intervals to stir things around. After fermentation is complete, some wines are bottled immediately and some are transferred to oak barrels to age for up to several years before bottling. I’m still learning the wine-making process, so forgive me for my lack of detail and bear with this old dog as I learn my newest tricks! Oh boy, oh boy, yesterday was an exciting day here at the vineyard. All of the staff came over after closing hours for a bit of on-site training. 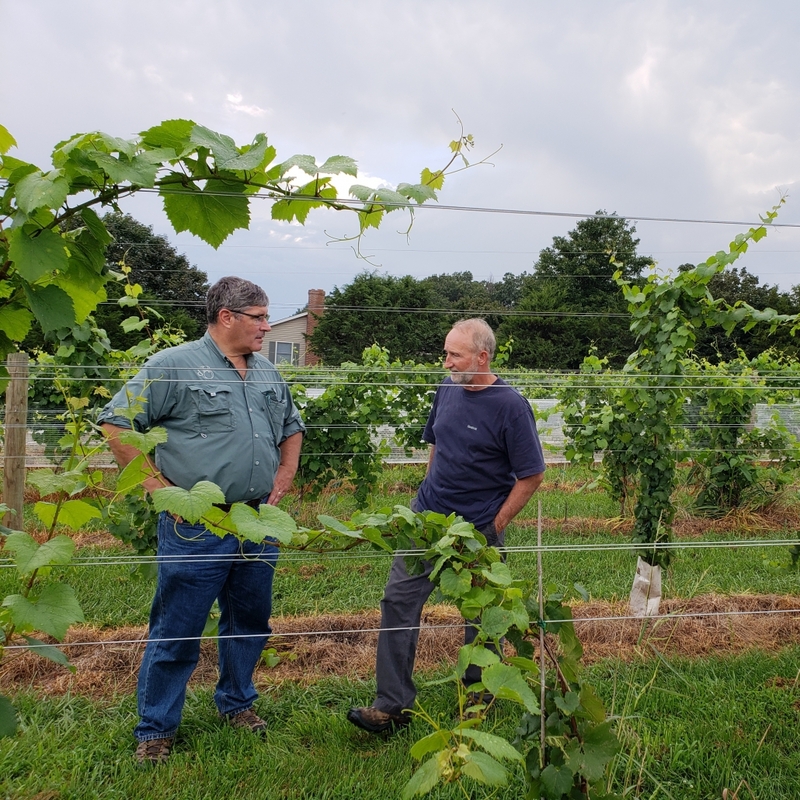 The field trip started with a reminder to all staff that, due to recent treatments, they may not to eat directly from any vines except Chambourcin. 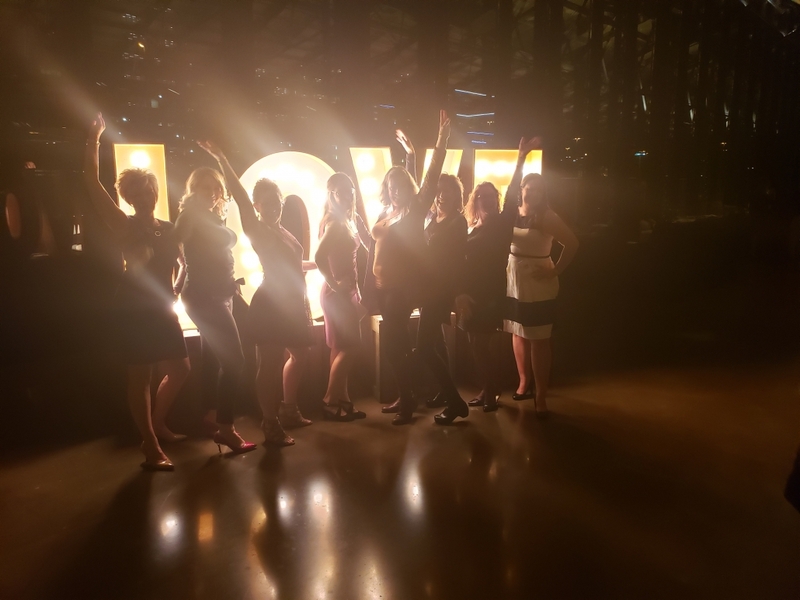 This was a very important reminder to our staff, because they seem to love all things eating and drinking that have to do with wine – and to be honest, who doesn’t? The journey around the vineyard started in our Chambourcin vines (coming into the vineyard they are the rows on your right hand side). We have about 2 acres planted of this grape, and it is growing exceptionally well. 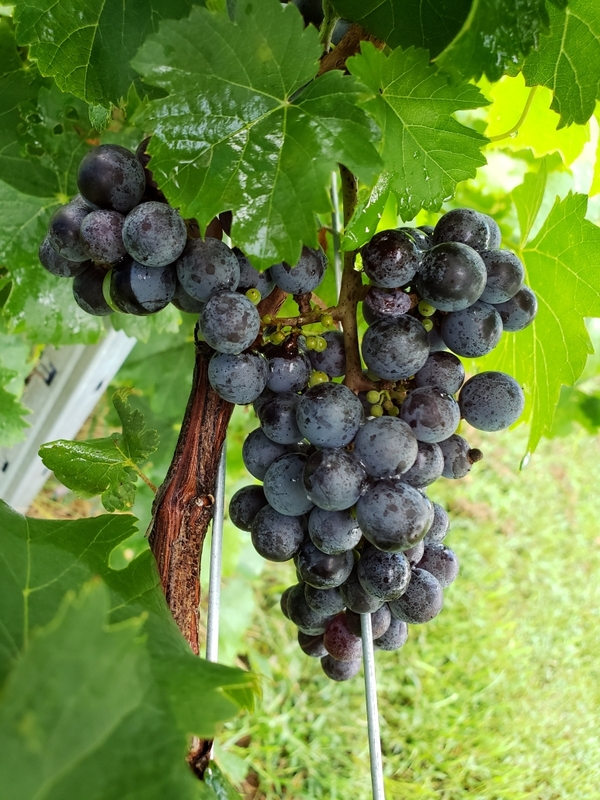 I’ve heard Mom say that this varietal will “fruit itself to death” and she has talked about “dropping” half of the fruit clusters. 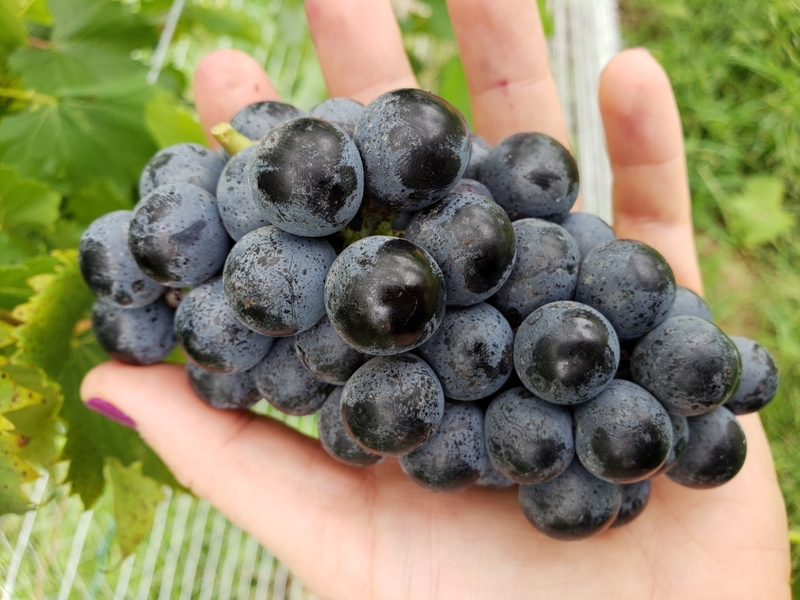 It took me awhile to figure it out, but apparently the Chambourcin vines just keep producing grape clusters even when it saps all of the energy out of the vines. 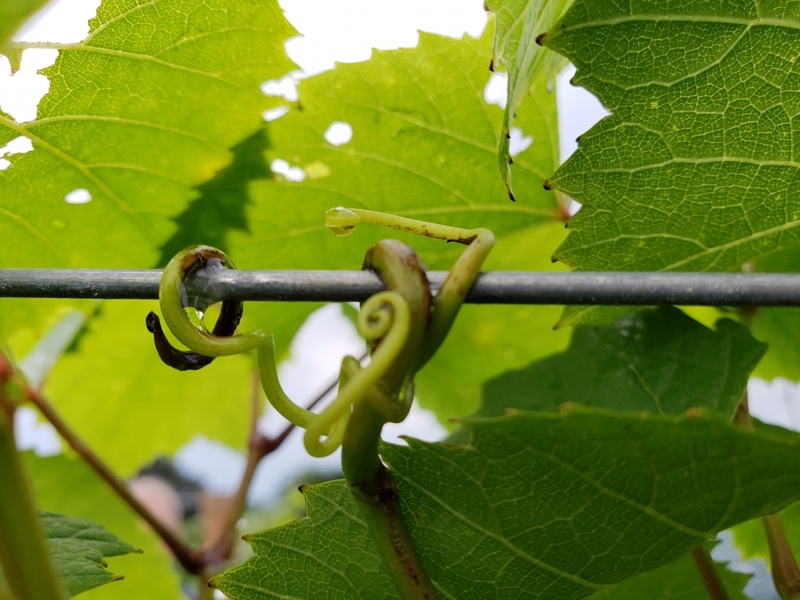 One way the vineyard managers can circumvent this in the vine’s younger years is by aggressively cutting off clusters and leaving just a few on vine. 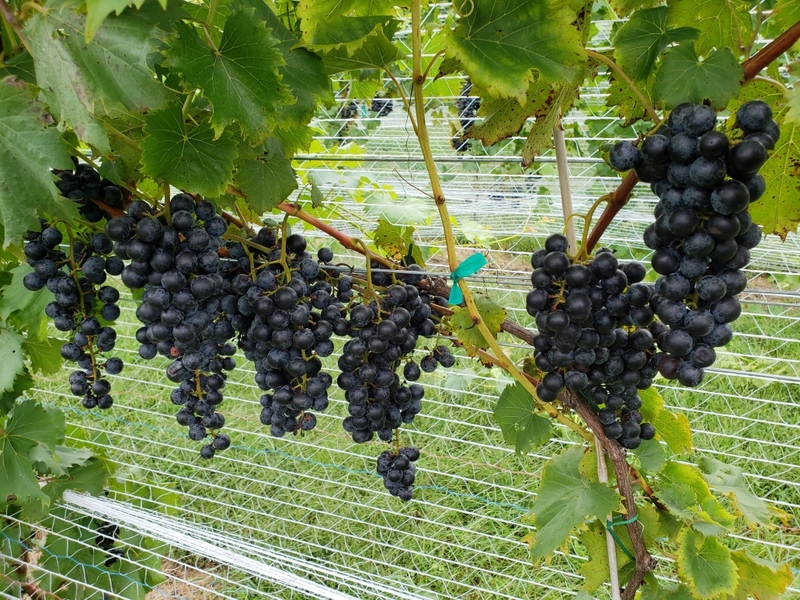 We are going to harvest our Chambourcin in about a month as we want it to fully ripen before harvest. 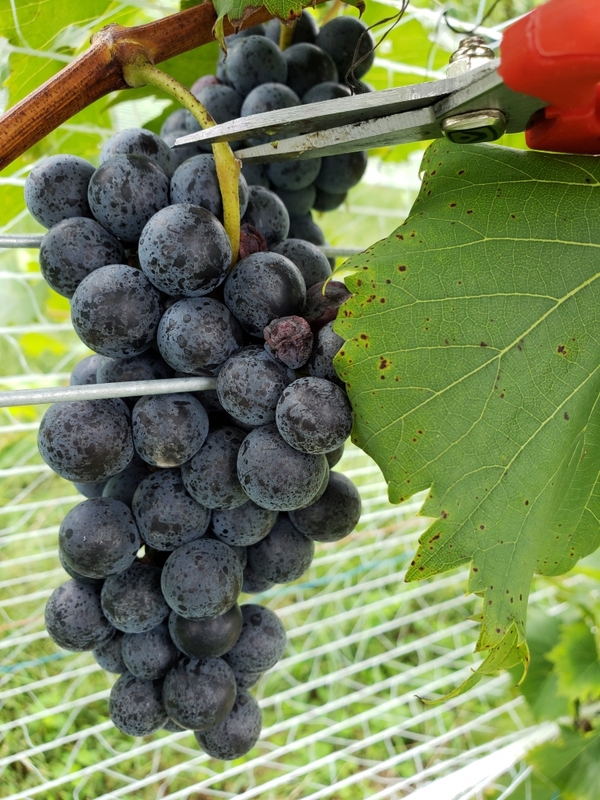 We would like the grapes measure about 23°-26° Brix and we estimate that we are going to get about 3.3 tons out of that lot. Next we stopped by the Vidal Blanc vines. These are the prolific vines growing on your left when you are driving toward the vineyard. I heard Dad remind everyone that during the height of the growing season, vines can grow up to 6 inches a day. In my world, that means they are growing one whole Winston every week! 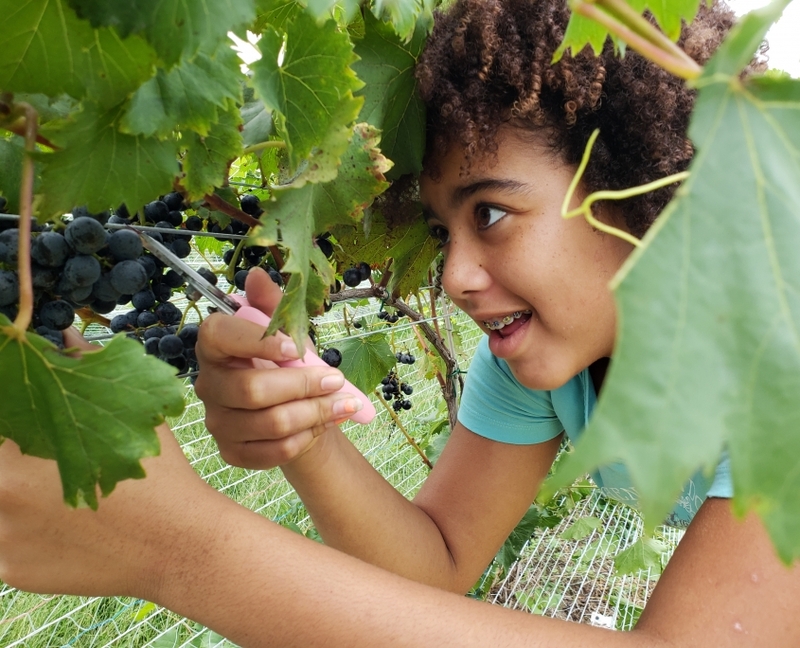 Mom and I walk the vineyard rows every single day to make sure the grapes are ripening correctly and to keep an eye out for any of the pesky wildlife that likes to eat our delicious grapes. Last weekend we saw something a little disturbing. 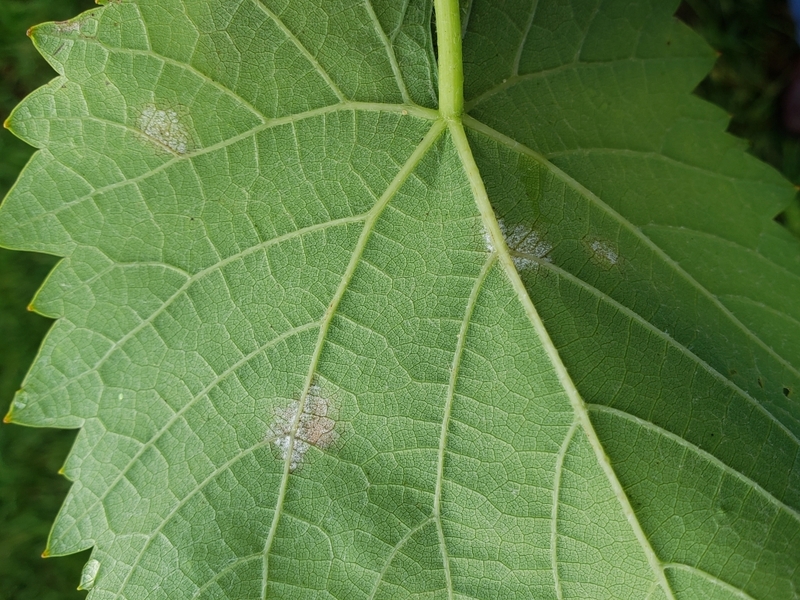 Our Vidal leaves were exhibiting signs of downy mildew. 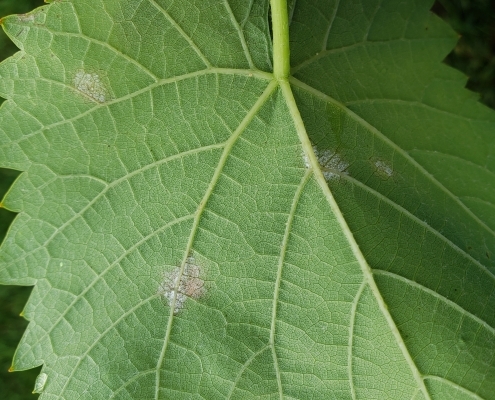 The first sign is yellowed spots scattered around the leaf, if left unattended, these spots will grow larger and the leaf will start to develop downy white spots on the underside of the leaf. 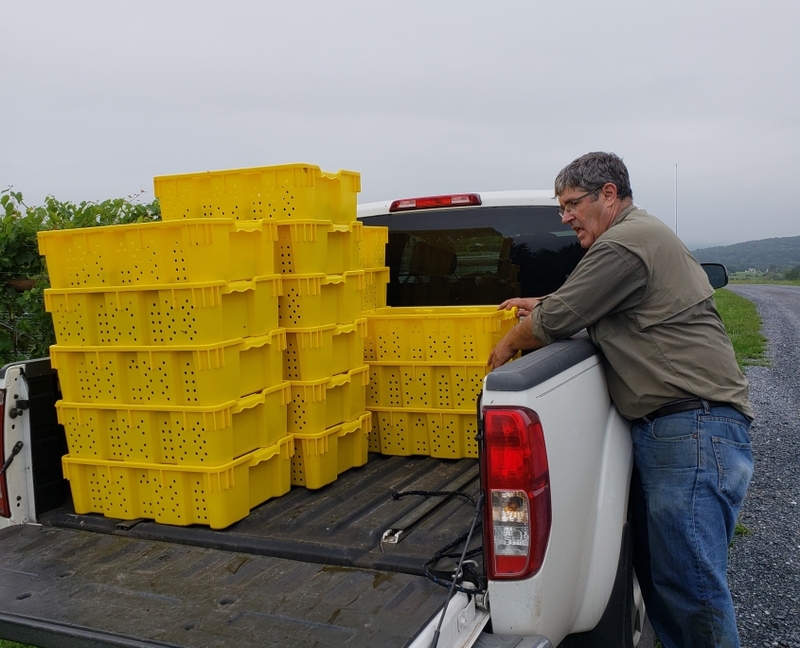 We treated the vines immediately, and we expect them to have returned to full health and vigor by the time we have our harvest our acre for approximately one ton in about couple weeks. 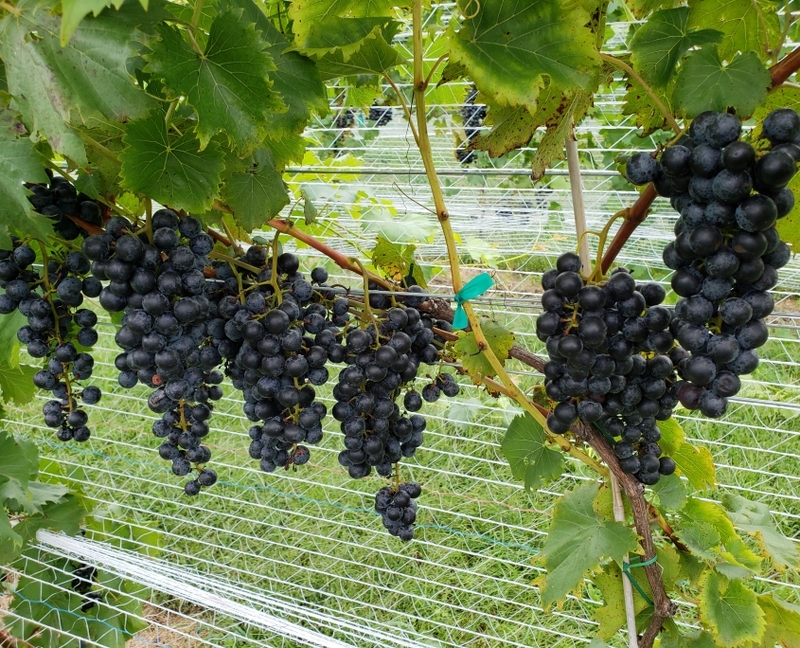 Our Cabernet Franc vines are a short walk down a few rows – you might be able to recognize them looking out from the tasting room because they are the only vines in the lower vineyard that aren’t wrapped in the protective covering. 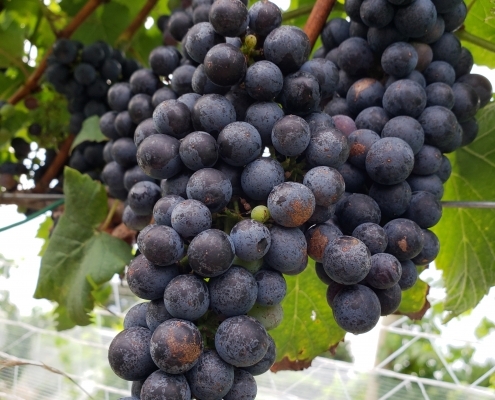 The grapes on these are very small – even smaller than the Petit Verdot whose name would suggest otherwise. There is quite a lot of growth happening at the bottom of these vines, and this is the root stock coming up as the plants establish themselves. It will be another month or more before they reach prime harvesting specs. Next it was back to the truck and on to the upper vineyard. To get there, we needed to drive around the barn and through a ravine that we have designated as a CREP area. This area can get a little washed out during heavy rains, and we almost always need to put it in 4wd to make our way up the hill. Thankfully, Dad finally listened to me and hopped out of the truck to lock all of the wheels into position. The road we were on deposited us directly next to the Petit Verdot. 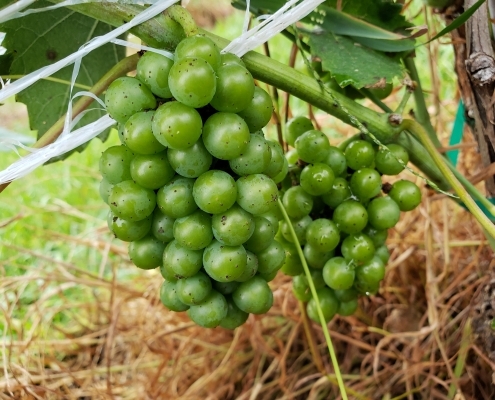 These grapes grow in very tight clusters and require the full length of the growing season to really come to their prime ripeness. Gene is pretty sure that we will get about 2,000 pounds out of these vines. I know that sounds like a ton (pun intended) of grapes, but it doesn’t actually translate to that much wine. One ton makes averages about 2.5 barrels and one barrel is equivalent to 300 bottles of wine. We will be harvesting both the Viognier and the Chardonnay in the next few weeks. 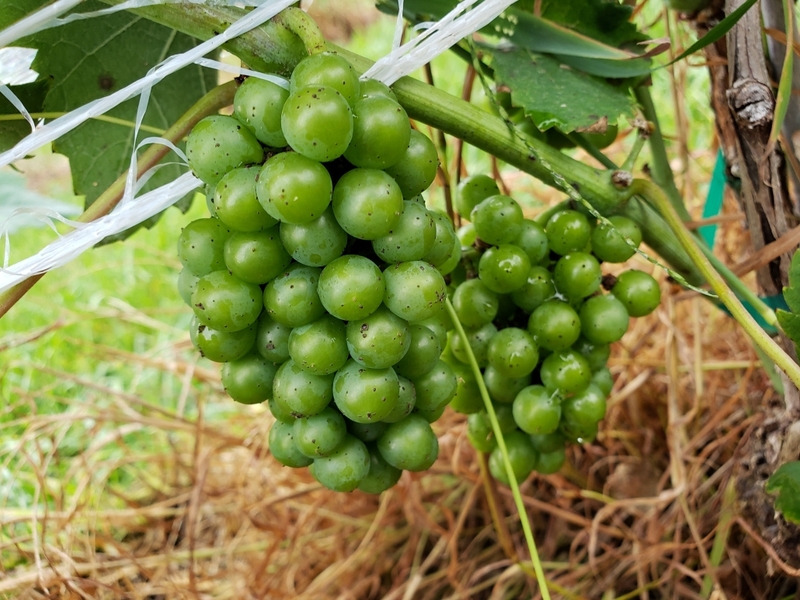 The Viognier vines look pretty bare, but they actually have quite a bit of fruit hidden beneath its leafy cover. 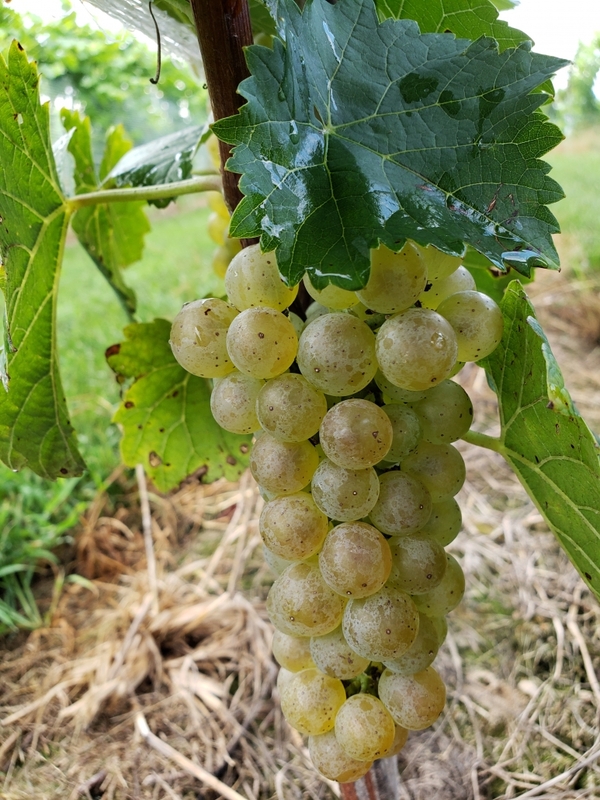 The Chardonnay clusters are even smaller than the Viognier, but I heard discussion that they have a much more delicate skin. 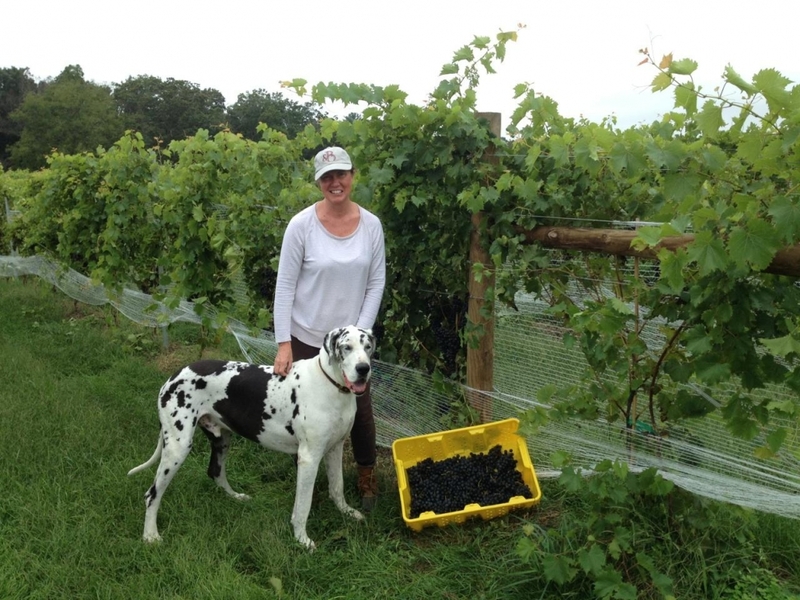 I would tell you for certain, but grapes are actually poisonous to dogs, so I steer clear as much as possible. 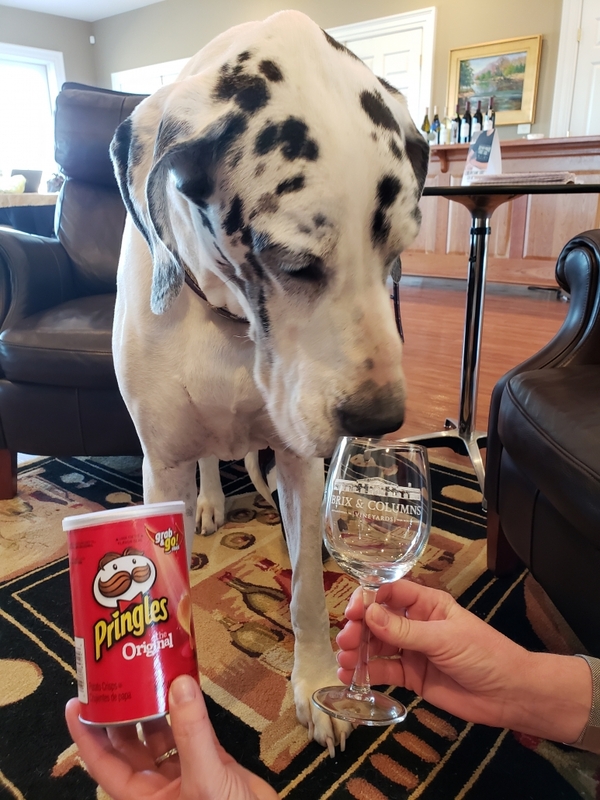 After touring the vineyard, everyone went back to the tasting room where Mom had an absolutely delectable spread of food. I tried hard to sniff everything out so I could tell you details, but all I heard was, “No, no, no.” Apparently Italian food wasn’t on my menu last night. The rest of the folks seemed to really enjoy the lasagna and chicken marsala from one of my Mom and Dad’s favorite restaurants, Romano’s. 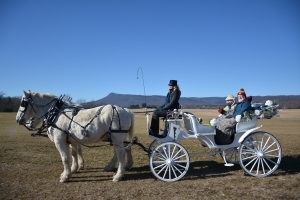 They even deliver to the vineyard! For dinner, all of our wines were on the table including some of the old favorites like the 2015 McGahey and Cab Franc. Our Port style even made an appearance for dessert! I think everyone had a really great time and everyone (except me) ended the evening with full bellies and tastes of delicious wines. A special thank you to Gene, our vineyard manager, for having such a growth mind set and bringing such energy and care to our vines!